When it comes to side quests in Red Dead Redemption 2, there are a total of 16 Stranger missions available - however, the very first one you can get onboard with involves a gentleman named Theodore Levin. Found in a Valentine saloon, Theo is writing a book and wants you to trace a gang of retired gunslingers to interview them about their shady pasts, though unsurprisingly these encounters mainly break down into a duel or firefight before long. In order to meet them, you'll naturally need to know exactly where to find all of the Red Dead Redemption 2 gunslingers first, so follow this guide for their locations and tips for how to deal with each one of them. To kickstart this map-spanning, multi-part Stranger mission, you must first head to the smaller of the two saloons in Valentine. Talk to the magnificently moustached writer Theodore Levin to start The Noblest of Men, and a Woman quest. Following a brief chinwag, the hairy scribe asks you to track down a group of crack shot outlaws so that he may finish his book on the esteemed (and super drunk) Jim “Boy” Calloway. Once this cutscene finishes, check out the Documents tab in Arthur’s satchel, then examine the four photographs to reveal the Gunslingers’ locations on your map. Located in the heart of New Hanover, this former outlaw is most likely the first Gunslinger you’ll naturally encounter in Red Dead Redemption 2. Head to the farm at Flat Iron Lake, and you’ll find this pistol-twirling legend has fallen on hard times. Poor Emmet is now a pig farmer, and before he’ll share his tales with Arthur, you must first help clear out his pigsty. Once you’ve shovelled up all that hog excrement, return to the retired shooter. An increasingly agitated Granger then challenges you to a duel. Press the right trigger at the earliest opportunity, then aim for Emmet’s head or chest to put him out of his misery for good. Take a photo of him to wrap up this quest. You should also loot his corpse to obtain the Granger’s Revolver, which is a fairly decent addition to Arthur’s arsenal. Ride to the train station at Rhodes to confront this Gunslinger. After speaking to the clerk, wait for the incoming train to stop, then hop aboard to meet up with the whisky-loving gunfighter. After a cranky confrontation at the train’s bar, Midnight makes a run for it. Follow him up to the carriage roof, then get ready for a swift shootout. Firing as quickly as possible is generally the best way to put Billy down, and after you’ve sent the outlaw to his maker, take a photo of him with your camera to end this sidequest. Make sure you also loot his corpse for Midnight’s Pistol: an outstanding handgun that boasts some of the best stats in the game. You can find this kickass shooter in Bluewater Marsh, just a few minutes ride north of Saint Denis. Unlike every other Gunslinger on this list, Belle and Morgan actually wrap up their encounter amicably. After Arthur unwittingly leads a clutch of bounty hunters to the ageing outlaw’s hideout, it’s up to you to clear them out. Use Belle’s porch for cover and beware of the Gatling gun the hunters bring to the pistol-flying party. Once you’ve cleared out all the enemies, Belle happily poses for a photo to end the mission. Unlike her fellow Gunslingers, Ms Belle doesn’t leave Morgan a rare gun, though you should still loot the corpses of those bounty hunters for useful ammo. The easiest Gunslingers mission in the game, and a shooty diversion that should take you all of two minutes to finish. After you’ve revealed Flaco’s location on your map, head to the sharpshooter’s location in Ambarino, located near the frozen Cairn Lake. After you confront and shoot his cronies, holster your gun, approach the nearby cabin, and Hernandez will eventually show his face. Once he does, a duel breaks out, so get ready to press RT/R2 as quickly as you can to pump the outlaw full of lead. 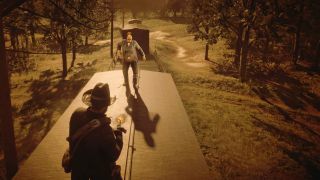 Red Dead Redemption 2’s quick draw duelling system remains a bit of a mystery, and we usually enjoyed the most success in these showdowns by pressing the right trigger as swiftly as possible, then betting our aim was good enough to pull off the first lethal shot. Once you put Flaco down, take his photo to complete the mission. You should also loot his corpse to obtain Flaco’s Revolver, one of the four rare weapons you can earn from these Gunslingers sidequests. After you’ve finished the first four Gunslingers quests, return to the same saloon in Valentine to complete this stranger mission – though this can only be done once you've reached at least chapter four. Speak to the bartender, and you’ll be informed that Levin and Calloway are residing on a boat resting in the port of Saint Denis. Check in on the writer and the sauced-up former sharpshooter, and the pair will send you to Annesburg to follow up a lead on Red Dead Redemption 2’s final Gunslinger, Slim Grant. Speak to the sheriff in Annesburg, and you’ll be tipped off to a nearby gang hideout where Slim is being held. Once you reach the site, take down the outlaws, then cut Slim free. After you’ve stowed a still hogtied Grant on your horse, ride to the new map marker to reunite with Levin and Calloway. During the ensuing cutscene, Jim shoots his former rival in the back, sparking Arthur into an impromptu duel with Calloway. Put the disgraced Gunslinger down for good to wrap us this prolonged Stranger quest. If you loot his corpse after the deadly deed is done, you’ll also be rewarded with Calloway’s Revolver: a rare and ornate Schofield pistol that’s well worth acquiring. Want to see how these rare pistols compare? Then check out our guide to the best Red Dead Redemption 2 weapons.